B. Thomas (Arlington, Texas, United States) on 30 November 2016 in Animal & Insect. Kitten crazies! The kittens found some old long lost cat toy, and even though they have many new toys of their own, for some reason they love this and have played it down almost to a rag. They attack it, it attacks them, and they steal it from each other then hide it until it turns up again soon. I find it in some really odd places. Great shot! 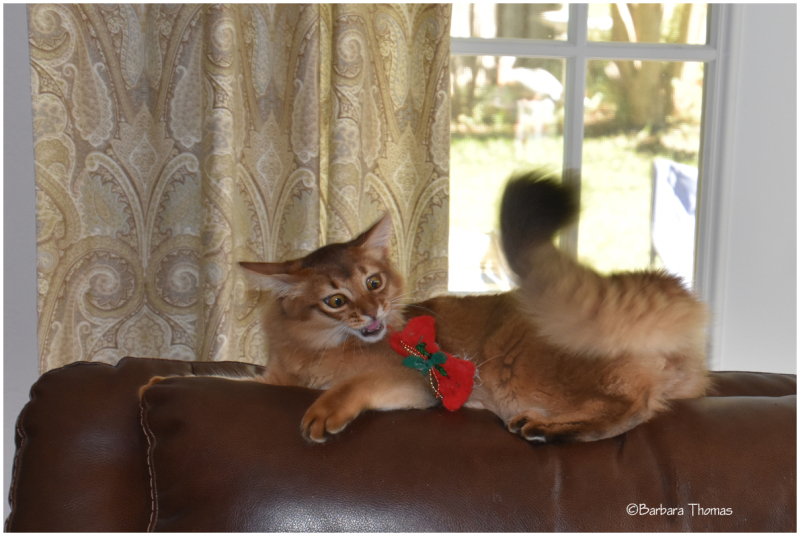 This shows the very essence of a somali kitten's play! That a couple of you will certainly lose weight, because you have to laugh so much. At least the abdominal muscles are a lot of fun gymnastics. Cat is a wonderful pet. Trop beau!! Une belle prise! He doesn't look too happy. Something you said? How interesting. Any concerns about how they might interact with the foxes? Avec son nœud tout rouge quel chat et vue superbe. Fabulous image! The feline expression is superb. Oh !! What a scary look here ! ...:-) ...Superb capture of the scene ! He has an intimidating look for sure! He has that fierce look with the fangs. An interesting (and funny) background story as well.